A solar attic fan can keep your attic cooler and reduce your cooling expenses! A solar fan can increase the air circulation in your attic, which will lower it's temperature. This in turn will allow you to keep your home cooler using less energy to operate your air conditioning system. But let's take a step back and look at why the attic gets so hot in the first place and how air circulation helps to cool it down. Then we'll take a look at how a solar powered fan can make a significant contribution to keeping your attic cool. Most people don't give their attics much thought. They simply know that if they go into their attic in the summer time it's hot up there. It gets hot in your attic because your roof takes the full brunt of the Sun's energy. As the Sun beats down on your roof, the shingles heat up. The shingles can reach temperatures up to 150 degrees F! This heat is transferred through the shingles, to the roof deck, to the lumber and rafters, and to anything else inside the attic. All of these materials will absorb and radiate the heat. As the day goes on, the heat builds up. Having a hot attic can make keeping your house cool a real challenge. The heat from the attic will work its way through the insulation and the A/C duct work and then into your living spaces. So to keep the inside temperature cooler, your air conditioning system will end up working harder. 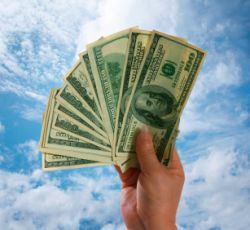 So if you can lower the temperature in your attic, you will be able to save money on your cooling expenses. To effectively lower the temperature in your attic you need to circulate air through it. Attic ventilation is the key component to keeping your attic cool. Soffit and gable vents allow relatively cool air from outside the house to enter into the attic. With venting alone, air circulation may occur naturally due to the force of the wind pushing the air into your attic or through natural convection causing the hot air to rise. But to really get the air circulating, you will need a fan near the peak of the roof. As the cool air enters at the lower part of the roof through the soffit vents or through the gable vents, the fan will pull that air up through the attic. As the air circulates over the lumber and other items in the attic, it picks up the heat and the fan pushes it outside. Using a solar attic fan to improve your attic's ventilation is a great way to increase the air circulation in your attic and help with your home's cooling. So even when the wind isn't blowing, you will be able to have air flow in your attic. Keep in mind that, depending on the amount of space in your attic, you may need to install more than one solar powered attic fan. They operate cost- and pollution-free. They operate on solar energy alone and don't give off harmful pollutants. They don't require an electrician to install. 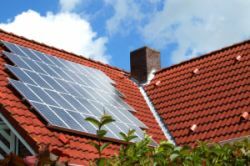 Since they operate on solar energy, you don't need to hook them up to your home's electrical system. A homeowner with basic DIY skills can install. They come with instructions that you can follow. 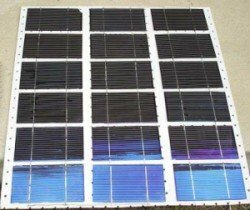 A great DIY solar energy project! Extend the life of your shingles. Excess heat can damage your shingles, which can void their warranty. Our Solar Cooling page has more ideas on how you can use solar energy to cool your home. If you're looking to save money on your cooling costs, you should definitely consider installing a solar attic fan.